This is Not "Not Running a Hospital"
But take a look anyway, if you have an interest in process improvement in hospitals. This is a collection of my best posts on this topic. You can find my main blog here. I've also included stories from training programs I've conducted around the world on this topic. What a pleasure it has been to meet thoughtful and well-intentioned people in other countries who are interested in enabling their hospitals to become learning organizations. Our early version of Lean in the Boston hospital was called BIDMC SPIRIT, so you will see a number of blog posts that refer to that. We came up with the concept of SPIRIT in November of 2007. All of the stories during the "SPIRIT" era had the logo atop, to provide a touchpoint for our staff. I've left some, but not all, of those logos on these reprints to give you a sense. Eventually, by July of 2009, we let SPIRIT die away as a program "brand," but the lessons we drew from that stage in our institutional development were extraordinarily helpful as we rolled out a philosophy more directly based on Lean principles. People often ask me how many staff members read my blog during the period covered by many of these posts. It is impossible to tell exactly, but the likely range is between 1500 and 2000 each day, out of the 6000+ FTEs and 900 doctors on staff. Some people regularly went to the blog link daily, others subscribed through Feedburner or another aggregator service, some read it on Facebook or Twitter, and others were referred to it by the clipping service published electronically each day by our media services department. I know, also, that when a specific staff member was mentioned in a blog post, s/he would circulate it widely to family, friends, and co-workers. This, in turn, led many people to send me story ideas about programmatic successes and setbacks, whether in clinical care or logistical or administrative arenas. It is hard to overstate the importance of this medium as a leadership, team-building, and institutional communications tool; but a very important aspect of that was that I wrote the posts myself, keeping them current and in my own voice. But blogging is really not the main point here. What you see documented is a consistent and decided institutional commitment to transformational change. It takes a long time and with constant reinforcement from the top folks to fight inertia and entropy and build sustained momentum for this kind of change. While the senior management has to work really hard to make this work, my personal involvement and interest as CEO and that of the Chiefs was essential. Another lesson is that personalizing the stories of success and setbacks is extremely important. You cannot overdo the recognition of individuals, whether formally or informally. Finally, this approach really works on many dimensions of quality and efficiency, as Steve Spear, John Toussaint, Gary Kaplan, Jim Conway, Bruce Hamilton, Jim Womack, John Shook, Peter Pronovost, Brent James, Mark Graban, Jeff Thompson and the others say. If there is any path for a general hospital or academic medical center through what is coming down the pike in terms of government and private payer revenue restrictions, and demands by the public for more personalized medical care, this is it. The attached scatter diagram from The Leapfrog Group is one indication of the kind of results that are possible. I have also transferred a blogroll here of useful resources in this field. You will find some of the world's experts listed therein, but also real-life people reporting on the work in their hospitals. Best of luck to you as you make health care safer, higher quality, and more efficient! 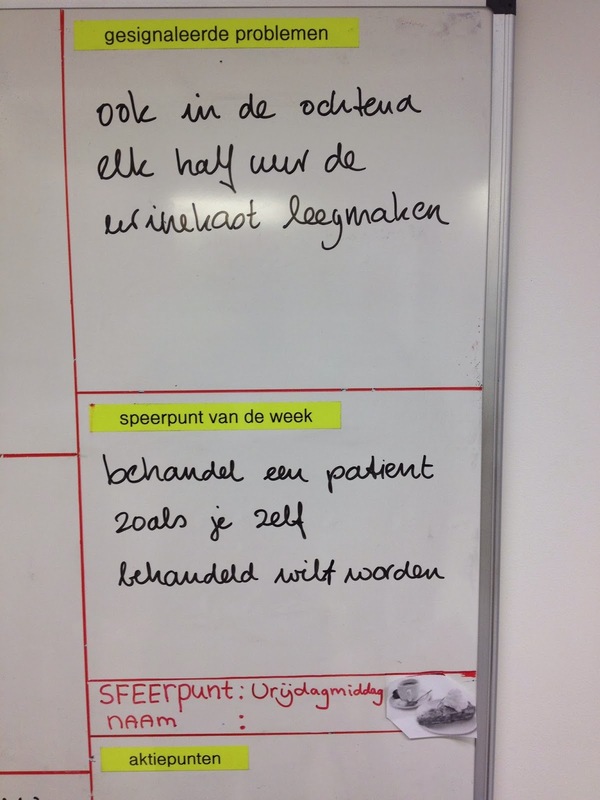 I had a chance today to visit one of my favorite hospitals, Jeroen Bosch Ziekenhuis in the Netherlands, and spend time with a number of managers who have been exploring a wider application of the Lean process improvement philosophy. 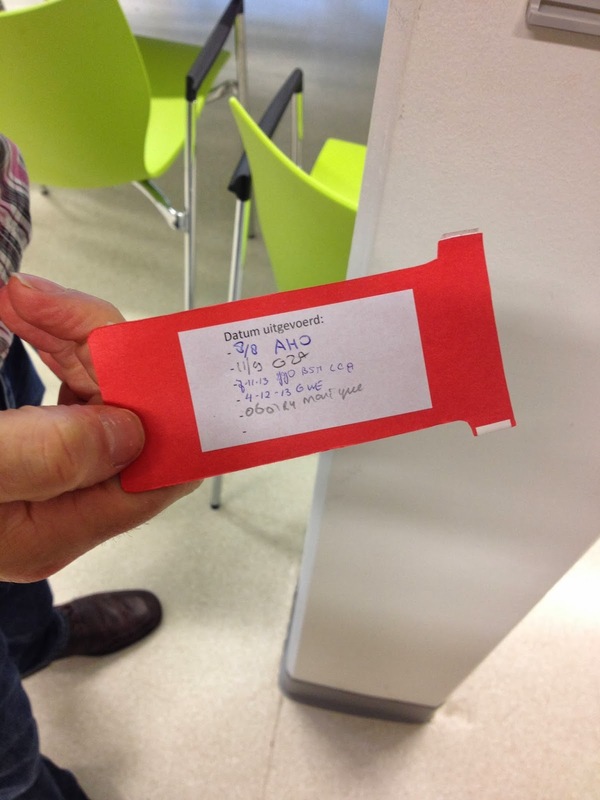 Frans van de Laar, who runs the blood and urine laboratory, recently introduced one of the simplest and most effective examples of standard work, a morning huddle with the staff who collect the daily flow of samples from inside an doutside of the hospital. You see Frans here with the white board, around which the staff huddles each day. After talking about projected workload and staffing responsibilities, one component of the huddle (seen below) is to identify a problem of the week that the group will attempt to solve or a situation which they will attempt to improve. Below that item, the group decides on an inspirational slogan for the week. This week is was: Treat a patient like you would want yourself to be treated. Frans was pleased to note that the huddle has changed a bit since he introduced it, with comments and suggestions from the staff being the impetus for modifications. Beyond the more serious changes, there was the addition of this humorous priority item in the huddle summary: Friday + [pictured] coffee and apple pie with ice cream! 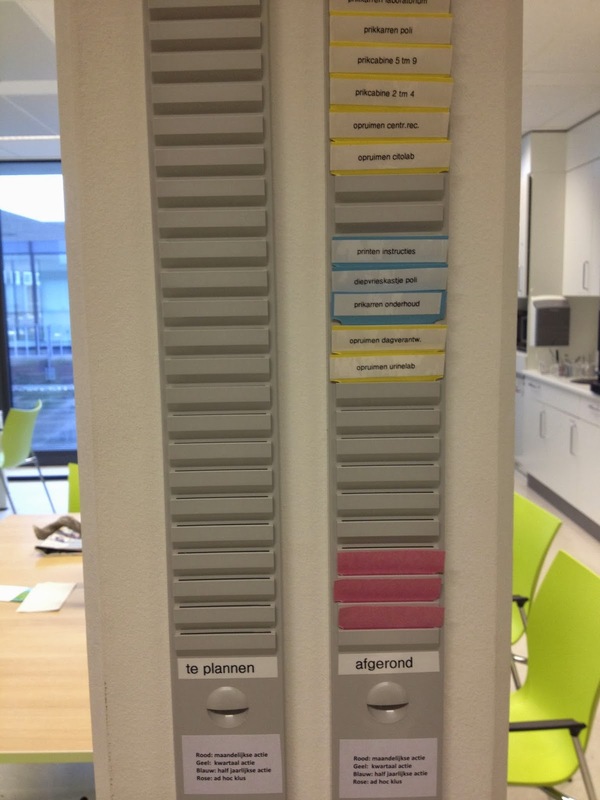 Another item adopted by Frans and his team is this voluntary assignment board for minor tasks that need to be done around the lab. Items are coded by whether they need to be done monthly, quarterly, half-yearly, or on an ad hoc basis and put in the left-hand slots. When a person has a lapse in regular lab work, s/he can volunteer to do the job. Once finished, the tag is moved to the right-hand side, with notes documenting when it was completed. One can imagine the alternative, spending time assigning people and monitoring their compliance with these items, possibly creating resentment at being assigned humdrum tasks. Instead, people volunteer during their slow work periods and feel a sense of contribution to the team effort. These two examples demonstrate that Lean is a state of mind and a philosophy: Small improvements, engaged front-line staff, and a manager who views his/her job as one of empowerment and service to the team. I now have total confidence that Lean process improvement has arrived for real and will soon be adopted in hospitals throughout the world. The source of my confidence? Watch this clip from this extremely popular, UK hospital-based soap opera, Holby City. The new young protagonist, Raffaello “Raf” di Lucca, is a highly driven registrar who is also (tah dah!) a Lean process improvement adherent. 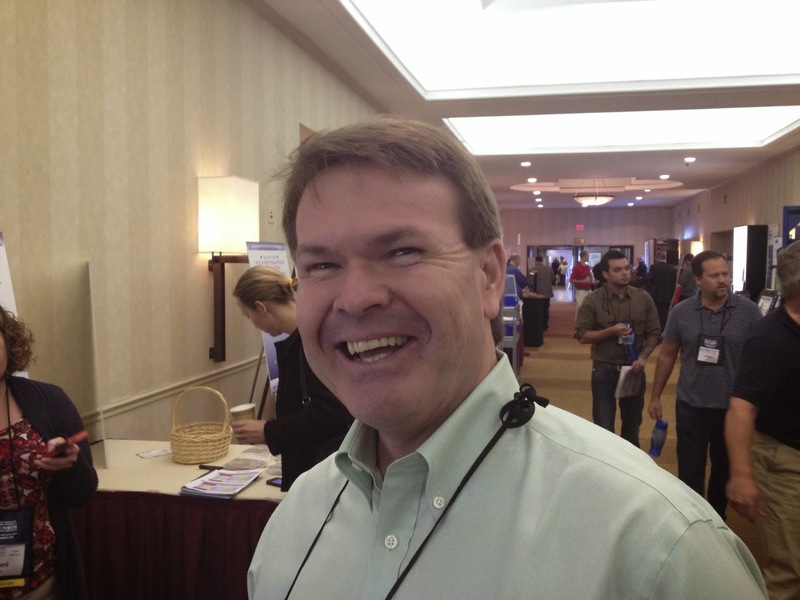 Hereford's Daniel Jones, founder and chairman of the Lean Enterprise Academy--which is "dedicated to pushing forward the frontiers of Lean and to spreading Lean to every kind of organization"--is finally getting his way! I've been meaning to write about this for several months--ever since attending GBMP’s Northeast Shingo Prize Conference this past fall. 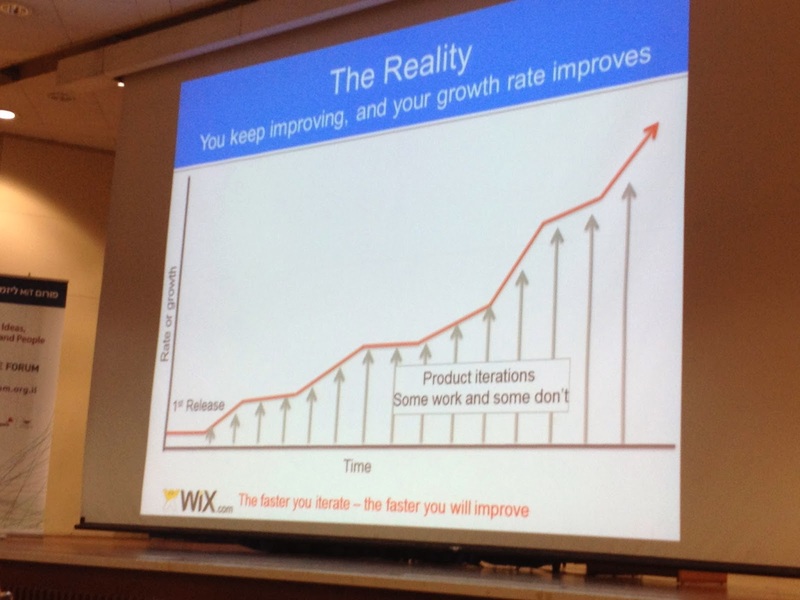 Short version: You never know where you will see a superb example of process improvement. Read more for the details below. The Center for Comparative Medicine at Massachusetts General Hospital has a mission of providing "the highest quality laboratory animal husbandry and veterinary services to MGH investigators and to ensure that all research animals at MGH are maintained and used in accordance with pertinent laws, regulations and accreditation standards." This is one of over 80 core facilities at Partners HealthCare System which are in place "to bring state-of-the-art instrumentation, methodologies and expertise crucial to the promotion of research on our campuses and beyond." (3) maintain a fulfilling, respectful, and safe workplace for our employees. The CCM has extensive facilities, including ventilated and static cages and racks, autoclaves, tunnel washers, rack washers, bedding dispensers, automatic watering (Edstrom), biosafety cabinets, cage changing stations. Services offered include procurement, husbandry, training, technical, import/export, quarantine, pathology, breeding, veterinary consulting, and customized research services to the MGH research community. CCM has been on its Lean journey for 8 years, and has adapted Lean tools and methods in novel ways to service their 5000 customers as efficiently as possible with a staff of 130 employees. The results are stupendous, as seen in the accompanying summary. As a pioneer in Lean management in Biomedical Research, CCM conducts Lean Tours, trainings and seminars to help accelerate the healthcare industry in the development of new therapies against disease. 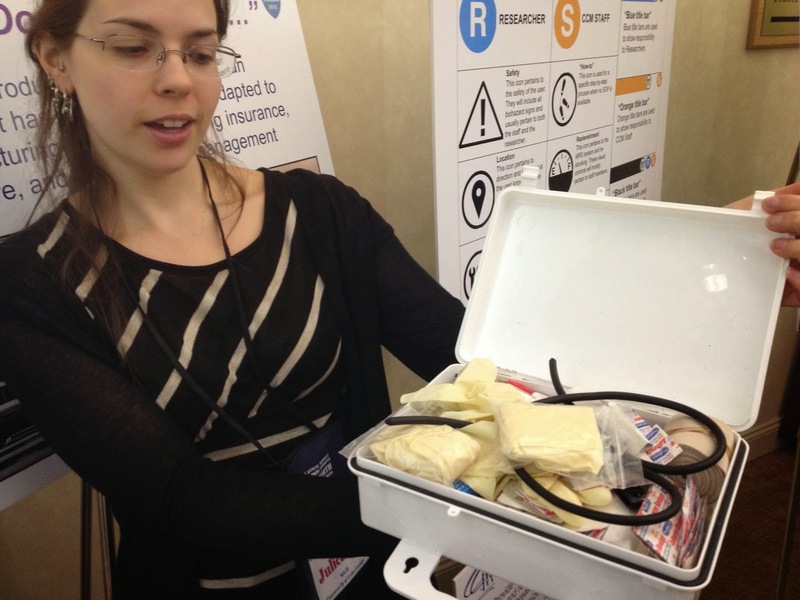 At the Shingo conference's "Lean Lounge," many of us were drawn in by a kooky display of dangerous animals and props. Gerry and his able partner Julieanne Brandolini showed us the innovative pedagogical tools they use in their instructional sessions. They have created a "Lean Starter Kit" and other kits that teach people the standard work that should be in place in various circumstances. Many conference attendees dropped by the display and stayed on for some time to learn from the good-natured presentations offered by Gerry and Julieanne. 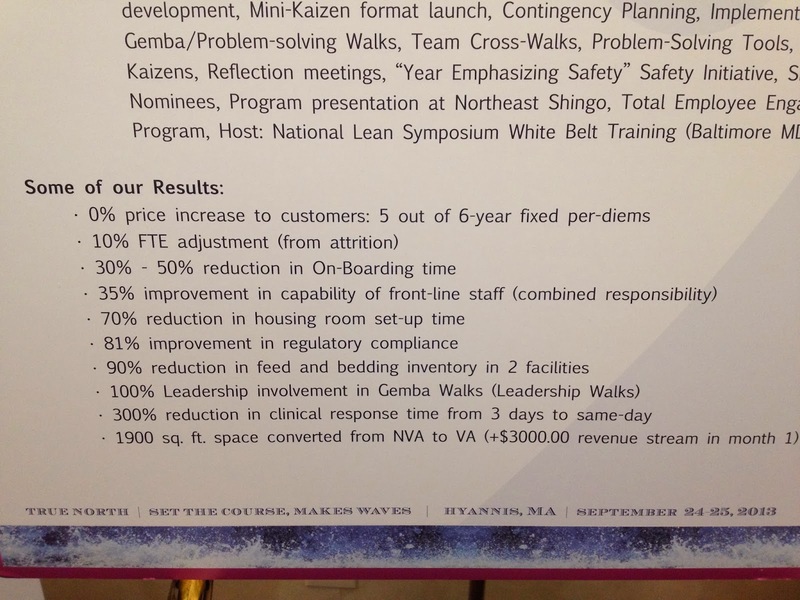 As Bruce noted in the article, "The theme of CCM’s 2013 Lean Lounge booth was 'if we can do it, anybody can.'" True enough, but the leadership has to be in place to make it happen. This was one shining example of such leadership. A colleague once said, “Every plan is excellent, until it’s tested. It’s execution that’s the problem.” And so it is. Project advocates enter every endeavor with a theory of the case, a vision of how things should be. But, as my late colleague Donald Schön noted, reflective practitioners are constantly reviewing the evidence to modify their framework in response to reality. Lean organizations understand that there is no group of central planners clever enough to design an optimum complex process. Lean leaders do not lack for a strong purpose—indeed audacious goals are favored—but neither do they lack humility. Lean and other similarly designed organizations can only exist where the senior leadership is a strong advocate for the proposition that reflective practice is the best way to achieve outstanding performance for their customers. The leaders of such organizations embed that modesty and reflection in every aspect of their lives. I never thought that I would be compelled to write another post about the manner in which oatmeal is served at the IHI Annual National Forum at the Marriott World Center in Orlando. Let me take you back to the original posts from 2010: 1, 2, 3, 4. Short version: The ladles (see above) provided to guests on the breakfast buffet were too large relative to the bowls, so oatmeal was being spilled all over people's hands and their bowls. Unsanitary and messy work-arounds were developed by the guests (like using the tea cup seen above.) I wrote a blog post about the issue, and the hotel responded by eliminating self-service and assigning staff to serve oatmeal at several stations, providing them with slightly smaller ladles. Now, three years later, I stopped by an oatmeal station and noticed that the ladle used by the server was still too large relative to the bowl size. So even with an experienced server, the oatmeal often spills over the edge of the bowl onto the hand of the server and the outside of the bowl. The server then has to use a small towel to clean off both the hand and the bowl. I say, sympathetically, "That would be easier with a smaller ladle." Response, "These are the smaller ladles. We use them instead of the regular ones when this group [i.e., IHI] is here. "You mean you use bigger ones when there are other groups here?" It is possible to sell great new ideas to hospitals, but they need to satisfy the interests of several constituencies in those organizations. They must improve the work flow of the staff on the floor and units, making day-to-day life easier and not harder. They must improve the safety and quality of care, but in a manner that does not expose the hospital to greater liability: Indeed they should help reduce liability. Finally, they should demonstrate cost savings and be priced in such a manner as to allow the hospital to show cash flow improvements rather than be a drain. 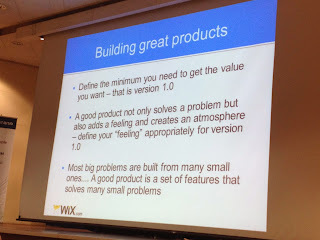 I was reminded this week by Caren Weinberg, senior lecturer of invovation and entrepreneurship at Ruppin Academic Center in Israel, that even this prescription is not necessarily going to result in a successful product roll-out. The element that I neglected to mention is the Lean concept of minimum viable product. Taking off on the practice of PDCA (plan, do, check, act) cycles, Ash Maurya notes that "the basic idea is to maximize validated learning for the least amount of effort. After all, why waste effort building out a product without first testing if it’s worth it?" Over time, he explained, the firm can add incremental features and improvements, all the while testing them with customers. The alternative approach that I have seen is for a firm to spend inordinate amounts of time and effort designing a spectacular technological fix to a series of problems without testing early concepts or prototypes against customers' needs and wants. It enters the market with a perfectly engineered product, only to discover that it is off track from what the market demands. Having depleted the company's capital, it falls into a financial hole and has trouble digging out. Thanks to Caren for the reminder that MVP stands for a "most valuable principle!" Critically Ill - How do we cure health care? Why are physicians minimizing the problem of preventable errors?